You'll be £13.50 closer to your next £10.00 credit when you purchase Flight Craft 5: Sukhoi Su-15. What's this? In the late 1950s, the Sukhoi Design Bureau, already an established fighter maker, started work on a successor to its Su-9 and Su-11 single-engined interceptors for the national Air Defence Force. Similar to its predecessors, the new aircraft designated Su-15 had delta wings; unlike the Su-9/Su-11, however, it had twin engines and lateral air intakes freeing up the nose for a powerful fire control radar. First flown in May 1962, the Su-15 officially entered service in 1965 and was built in several versions, the late ones having cranked-delta wings and a more capable radar. Being an air defence fighter, the Su-15 frequently had to deal with intruders. Unfortunately the aircraft gained notoriety in two separate incidents involving shoot-downs of Boeing airliners (a 707 in 1978 and a 747 in 1983), both of which were South Korean and had intruded into Soviet airspace on what was very probably clandestine spy missions. This book describes the developmental and service history of the Sukhoi-Su-15, containing a comprehensive survey of all model-making kits currently available on the market. ... A lot of attention is devoted to technical details in this book and complemented with actual stories from the operational period which makes this book nice and readable. 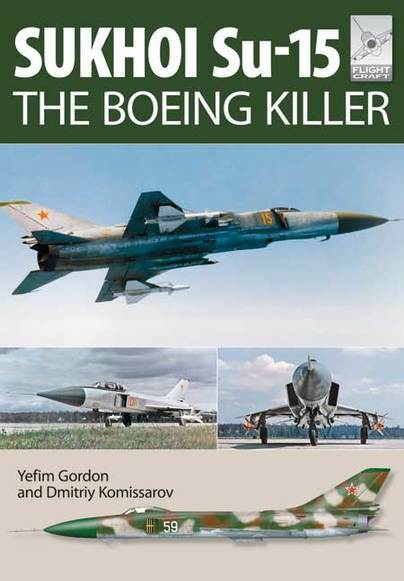 The Boeing Killer is a book for the collector, who is interested in the history of Russian war planes and especially this type of plane. A nice document with beautiful imagery. The fifth title in this Flightcraft series from Pen and Sword takes on the subject of another Soviet Cold War jet, the Sukhoi Su-15. This was a design of the early 1960's, built to update the Soviet fleet of interceptors and make them more capable to meet the newest threats from NATO equipment. Using a new and large radar meant doing away with the nose intake for the jets, so often associated with Soviet jet aircraft. It also was to have two engines, partly a solution to crashes due to engine failure in the earlier, single engined Su-11. The prototype first flew towards the end of 1962 with the designation of T-58. Improvements and modifications were made to the next two prototypes as they continued test flying through 1963, with production aircraft finally going into service in 1967. The first section of the book gives the full story of this development history,'The SU-15 is Born'. Section 2 then looks at the 'Experimental Versions and Testbeds' and this includes details and pictures of one fitted with two additional 'Lift' engines to provide a STOL (- Short Take-Off and Landing) capability, plus a number of other trials that were carried out between 1966 and 1973. This is followed by 'The Su-15 in Action', with details of some interceptions they made particularly on the Turkish and Iranian borders with the Soviet Union, as well as two other incidents involving South Korean Boeing airliners. The first was a Boeing 707, which was damaged by and then force landed while the second involved a Boring 747 which was shot down with heavy loss of life and world outcry against the incident. The final section on the real aircraft is 'The Su-15 in Detail', which goes over each element of the airframe and includes useful data tables. To round things off for these Flightcraft titles it features a Modellers Section, where all the available kits and aftermarket accessories are given useful reviews. Not step by step build sequences but helpful reviews of the available products on the market, and illustrated with examples of the completed models. These include both 1/48 and 1/72 scale models and aftermarket sets for them.